How does one explain the unexplainable? Is there an idea, an original aspect that sets people off to murder repeatedly, that makes them serial killers? Is it the hunger for more that haunts society that motivates the serial killer and makes them strive for short-time satisfaction through repetition of their murders? Serial killers themselves describe their deeds as repetitions that make them happy. 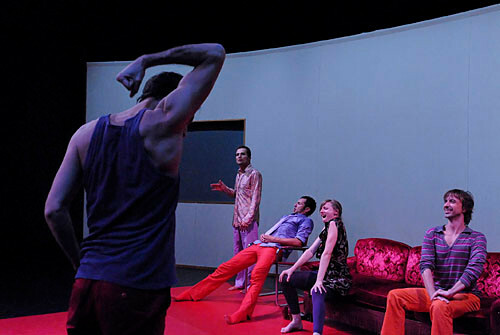 Repetition as movement, this is performance, theatre – the theatre of the serial killer is a “theatre of cruelty”. But what is the appeal of their production? Why needs our modern global society this most shocking and most insufferable of all human anti-heores? 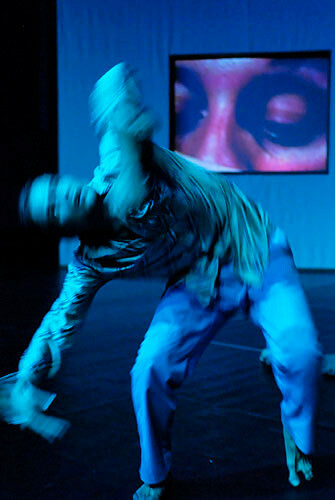 With their performance “KILLER LOOP”, Cocoondance tries to get onto the trail of the serial killer – who has become a media superstar thanks to the pursuit of the series – and to make a connection between the search for happiness and the behaviour of the serial killer, and not to separate this behaviour from what is humanely possible. "In LOVERS AND OTHER STRANGERS, the same dancers went into a highly emotional fight. Now, five years later, closeness, intensity, love, seem to have been used up. (...) Among the most impressive moments are two virtual duets. The first one is being performed above the monitor and develops out of the relation between proximity and distance to the camera, from signs of intensity gone-by and gazes full of signals. During the second duet, the wall prevents touching. 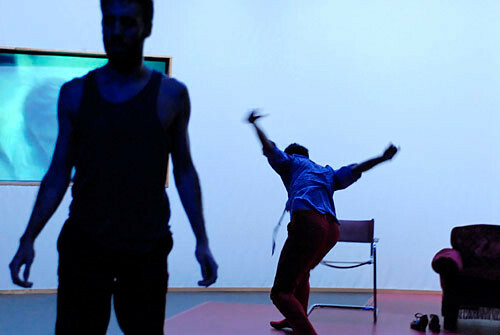 Rafaële Giovanola makes the dancers stroke the wall, one makes a movement, the other responds. Viviane Escale and Samuel Guist thus develop a tentative delicateness in their expression which stands in sharp contrast to the directness in “LOVERS”. 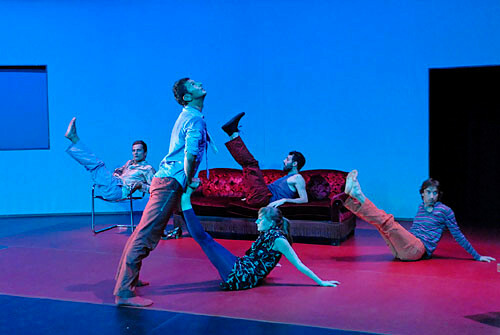 Between these two scenes, however, the focus is on the other you, the “ANOTHER YOU.”"
"For five years, since LOVERS AND OTHER STRANGERS, the collaboration between Viviana Escale and Volkhard Samuel Guist has endured, and accordingly their jubilee performance of “ANOTHER YOU” is very impressive. (...) Man and woman as beginning and end of all. The couple as the fundamental element of classical dance. However, as much as both pieces are connected, as much separates them. For “him” as for “her”, the piece moves more towards an end. (...) These are images of an estrangement through media. They meet in the electronic “contact court” of the internet. Not just flirtation, but also the undertaking to make a relationship work, happen there. (...) At one point, she wanders through a darkening world with a flashlight, searching for the other: Thus, this is also a parable of two who cannot come together. And a huge reminiscence of art for which Rafaële Giovanola contrived a whole spectrum of beautiful gestural references."